Patnos - Dogubeyazit - 2initineres Webseite! It’s our last 2 day trip in Turkey. Leaving Patnos we realize, that all stores and restaurants are closed due to the festivities that take place at the end of Ramadan. The festivities will last for three days and usually take place within the family. 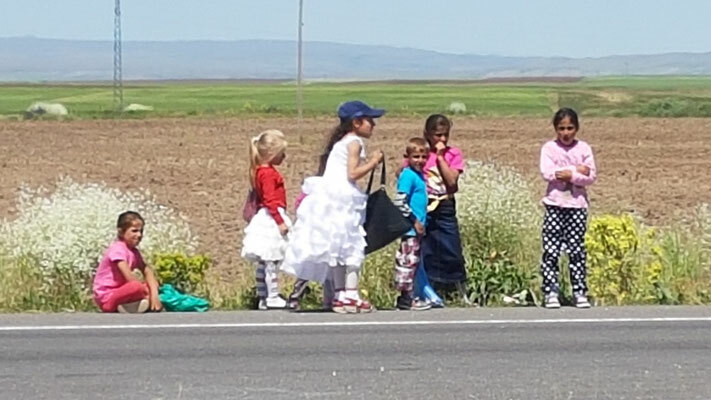 On the way to Agri we see many children, all nicely dressed up; the boys wear suits, wheras the girls love showing off with their new and colourful dresses. The weather is nice and finally the high temperatures reached our region too. Therefore, many families sit outside in front of their house, drink cay and eat some sweets. Once more a family invited us for a tea and a break in a nice garden. Monday, June 26, was a tough day. 90 km were ahead of us and the weatherforecast predicted strong headwinds. Not again! It took us more than 6 hours of biking to overcome the distance. Markus and I decided to alternate every 15 min., once it was Markus and then again me who rode in front. We also took more breaks than usual. For us it was important to manage our energy level well. That was no fun at all L. In the late afternoon we finally reached Dogubeyazit. Most of the shops were closed here as well. At least we managed to find a fast food and a small market place to buy some food, which we ate on the balcony of our nice hotel. For a change we also got some wine, which compensated for all inconveniences. The city Dogubeyazit is the last big city at the border to Iran. It is also well known because its location is at the bottom of the Mount Ararat. Morover, the Ishak Pasa Saryi , one of the most famous places of interest of Turkey, is only 6km away, overlooking the city. It was built in the 18th century by Emir Ishak Pasa, who got his fortune through raids and tolls. He built it out of some remains of a former fortress. Our visit there was really worthwile. Alltogehter we spend 4 days in Dobubeyazit. We take some rest, read a lot and make our last preparations for Iran. Markus buys a new Samsung. Finally he got a new “toy”! This allows us to get an Iranian SIM card which we then can put in the new phone, make a hotspot if necessary etc. 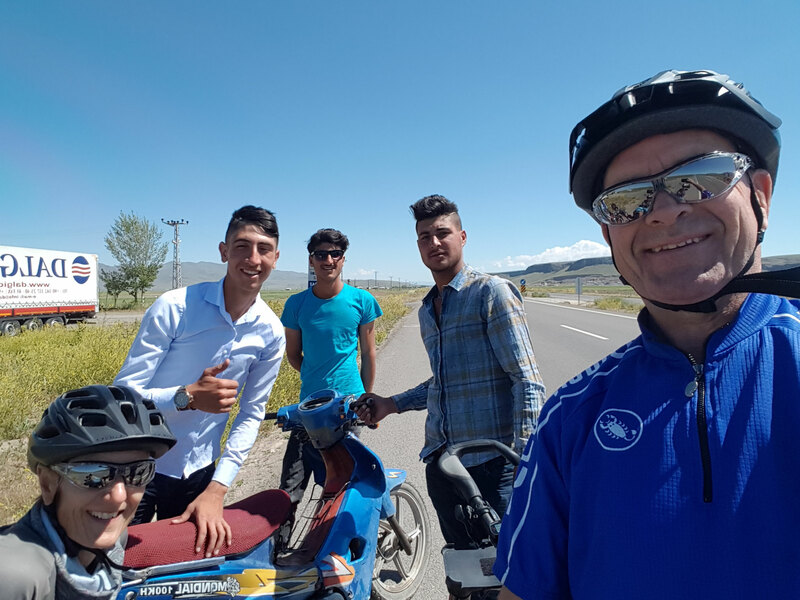 We followed up on our route, checked where we will have hotels in Iran and where we will have to camp. We also loaded some maps of Iran, we have to learn the numbers as well as some important expressions in Farsi and get used to the new currency (1€= 37’000 Rial, we probably need an additional bag for all that money). Yesterday evening we got an unexpected visit from Buhin shom we had met some weeks ago in Refahyie. He spent some days of vacation in Eastern Turkey. Thanks to my posting of the mountain Ararat in facebook he realized that we are in the same city. Thanks to all the social media it was easy for him to contact us. We had dinner together, and had once more the chance to have interesting discussions about the contry and it’s people. For the time being, we now wait that we can enter Irant the day after tomorrow and start the next adventure.